At the same time Confucius' teachings were spreading through China, another religion was also having its beginning. In contrast to the humanistic, ethical teachings of Confucius, the mystical, enigmatic beliefs of Taoism (pronounced "Dowism") appeared. Behind this enigmatic religion is itself an enigmatic figure named Lao-tzu. Taoism has its roots in a shadowy figure named Lao-tzu, of whom little or nothing is verifiable. Many scholars feel that Lao-tzu never existed at all. His date of birth is uncertain, being put variously between 604 and 570 B.C. One legend said that he was never young but rather was born old with white hair, a long white beard and wrinkled skin. Another story has him named Plum-Tree-Ears by his mother because he was born under the shadow of a plum tree and his ears were unusual-ly long. However, he was known to the people as Lao-tzu, meaning "the old philosopher. " He supposedly held an important post as curator of the imperial archives at Loyang, the capital city in the state of Chu. His government position became tiresome, for Lao-tzu disapproved of the tyranny of the rulers and the idea of government itself. Lao-tzu came to believe that men were meant to live simply wiTaout honors and without a fruitless search for knowledge. Consequently, he resigned his post and returned home. Since his opinions had gathered unwanted students and disciples, Laotzu left his house to seek privacy from curiosity seekers. He bought a cart and a black ox and set out toward the border of the province, leaving corrupt society behind. However, at the crossing of the border the guard, his friend Yin-hsi, recognized him and would not allow him to pass. Yin-hsi exhorted Lao-tzu, "You have always kept to yourself like a hermit and have never written down your teachings. Yet many know them. Now you wish to leave and retire beyond our borders. I will not let you cross until you have written down the essentials of your teachings." Lao-tzu returned after three days with a small treatise entitled The Tao Te King, or The Way and Its Power (sometimes translated as The Way and Moral Principle). Then he mounted a water buffalo and rode off into the sunset, never to be heard of again. Another version of the story has the gatekeeper Yin-hsi begging Lao-tzu to take him with him after he read The Tao Te King. Whatever the case may be, the little book was left behind and became the basis for a new religion. The Tao Te King, also known as the Lao-tzu, is a small book of approximately 5,500 words instructing rulers in the art of government. It teaches that the less government, the better, and that a ruler should lead by non-action. Needless to say, no ruler in the history of China has taken the political section seriously. However, there is a philosophical side to The Tao Te King that has had enormous impact. The work teaches individuals how to endure life against the terrible calamities that were common in China. It advocates a low-key approach of non-ambition and staying in the background which will help one's odds of survival. There is an ongoing debate as to when The Tao Te King was composed. The traditionalist point of view has the work composed by Lao-tzu, a contemporary of Confucius, in the sixth century B.C. The basis for holding this traditional date is the biography of Lao-tzu in the Shih-chi (Records of the Historian) about 100 B.C. The modernists view the work as having been formally compiled about 300 B.C. because of the similarity of style to works composed in that period. The historical setting, they argue, fits more with this turbulent era, than with the earlier one claimed by the traditionalists, alTaough the modernists do believe many of the sayings actually come from a much earlier time. Apart from Lao-tzu, the most important figure in Taoism is Chuangtzu, a disciple of the famous Lao-tzu. Chuang-tzu was a prolific author living during the fourth century B.C. who wrote some 33 books. Chuangtzu was a clever writer, popularizing the teachings of Lao-tzu as Mencius did with his master, Confucius. Once I, Chuang Chou, dreamed that I was a butterfly and was happy as a butterfly... Suddenly I awoke, and there I was, visibly Chou. I do not know whether it was Chou dreaming that he was a butterfly or the butterfly dreaming it was Chou. Between Chou and the butterfly there must be some distinction. This is called the transformation of things (Wing-Tsit Chan, ed., A Sourcebook in Chinese Philosophy, Princeton, NJ: Princeton University Press, 1963, p. 190). When she died, how could I help being affected? But as I think the matter over, I realize that originally she had no life; and not only no life, she had no form; not only no form, she had no material force. In the limbo of existence and non-existence, there was transformation and the material force was evolved. The material force was transformed to become form, form was transformed to become life, and now birth has transformed to become death. This is like the rotation of the four seasons, spring, summer, fall, and winter. Now she lies asleep in the great house (the universe). For me to go about weeping and wailing would be to show my ignorance of destiny. Therefore I desist (Ibid., p. 209). 212 Emperor Shi Huang Ti burned Confucian books, and established Taoism, sent naval expeditions to Fairy Islands to discover the herb of immortality. 574-581 Emperor Wu arranged order of precedence, viz., Confucianism, first;Taoism, second; and Buddhism, third; but soon became disgusted with Taoism and Buddhism and ordered their abolition. The next emperor, Tsing, re-established both non-Confucian religions. 650-684 Lao-tzu canonized as an emperor; his writings included among sub-jects for government examinations. 713-742 Emperor Kai Yuen distributed copies of the Tao-Te-King throughout the empire; took a dose of Taoist "gold-stone" medicine; magicry increased. 825-827 Emperor Pao-li banished all Taoist doctors on account of their in-trigues and pretensions away to the two southernmost provinces of China. 841-847 Emperor Wu Tsung ordered all Taoist and Buddhist monasteries and nunneries closed. Later he restored Taoism to imperial favor, and stigmatized Buddhism as "a foreign religion. " Took Taoist medicine to etherealize his bones, so as to fly through the air like he fairies. 1661-1721Emperor Kang Hsi ordered punishment not only of the Taoistquacks, but also of the patients; forbade Taoist assemblies and pro-cessions; endeavored to suppress the various Taoist sects. 1900 The Boxer Uprising originated in a sect of specially ardent Taoists who believed their bodies would be immune against foreigners' bullets, trusting the exact words of the founder: "When coming among solders, he need not fear arms and weapons. . ." (Robert E. Hume, The World's Living Religions, New York: Charles Scribner's Sons, rev. ed., 1959, pp. 147, 148). In The Tao Te King, the central concept is that of the Tao. Finding the proper definition of the term is no easy task, for while the word "Tao" literally means "way" or "path," the concept goes far beyond that. The opening words of The Tao Te King express the Thought that the Tao that can be understood is not the real Tao. The name that can be named is not the real name. A famous Taoist saying is, "Those who know don't say and Those who say don't know." It is a mysterious term beyond all our understanding, imagination and senses. Yet it is the way of ultimate reality, the ground of all existence. It is the way of the universe, the way by which one should order his life. The cosmic Tao is invisible, inaudible, unnamable, undiscussable, inexpressible (Max Mueller, ed., Sacred Books of the East, London: Krishna Press, 1879-1910, 40:68, 69). The perfect man is peaceful like the Tao (Ibid, 39: 1992-193). The ideal condition is a by-gone utopian simplicity in a state of nature (Ibid., 39:278). Vacancy, stillness, placidity, tastelessness, quietude, silence, non-action this is the level of Heaven and Earth, and the perfection of the Tao (Ibid.,39:331). The question arises, how does one get his life in harmony with the Tao? If mankind's chief aim is to conform his existence to the way of the Tao, what must he do to accomplish this? The Tao Te King teaches this can be done by practicing the basic attitude of Wu Wei, which literally means inaction. This principle calls for the avoidance of all aggressiveness by doing that which is natural and spontaneous. Mankind should live passively, avoiding all forms of stress and violence to properly commune with nature. In doing this, his life will flow with the Tao. These concepts are interdependent and find themselves as expressions of the Tao. The concept of yin and yang is used to explain the ebb and flow in both man and nature. According to Taoism, "to blend with the cycle (of the universe) without effort is to become one with the Tao and so find fulfillment" (Maurice Rawlings, Life-Wish: Reincarnation: Reality or Hoax, Nashville, TN: Thomas Nelson Inc., 1981). An understanding of the world had emerged: there were powers from above associated with Heaven such as rain and sun, and powers of the earth below such as the fertility of the soil. It follows naturally that the forces of heaven and earth should be in a state of interaction and that all of life flows from this interaction. All people have observed this process in nature, have planted and harvested their crops accordingly, and therefore developed a rhythm of life. The ancient Chinese sensed beneath this rhythm the movement of two basic forces called yang and yin. Yang is above, male, light, warm and aggressive; yin is below, female, dark, cold, and passive. Harmonious life is a complementary interaction of male and female, darkness and light. Rain and sun (yang) fall on the earth (yin) and crops grow. The passive yields to the aggressive but, by yielding, absorbs and overcomes. The result is a philosophy of continual change which is believed to explain the rise and fall of dynasties as well as the change from day to night and back to day again. The goal of this process is a harmony between ruler and subject, among the members of the family, and in society as a whole becomes the goal of life, both in ancient China and among many Chinese today (Richard C. Bush, The Story of Religion in China, Niles, IL: Argus Communications, 1977, pp. 6, 7). Conceived of as having no name, it is the Originator of heaven and earth; conceived of as having a name, it is the Mother of all things. Always without desire we must be found, If its deep mystery we would sound; But if desire always within us be, Its outer fringe is all that we shall see. He who knows the Tao does not care to speak about it; he who is ever ready to speak about it does not know it. He who knows it will keep his mouth shut and close the portals of his nostrils. He will blunt his sharp points and unravel the complications of things; he will temper his brightness, and bring himself into agreement with the obscurity of others. This is called "the Mysterious Agreement." Such a one cannot be treated familiarly or distantly; he is beyond all consideration of profit or injury; of nobility or meanness -he is the noblest man under heaven. To recompense injury with kindness. The master of it anticipates things that are difficult while they are easy, and does things that would become great while they are small. All difficult things in the world are sure to arise from a previous state in which they were easy, and all great things from one in which they were small. Therefore the sage, while he never does what is great, is able on that account to accomplish the greatest things. There was something undefined and complete, coming into existence before Heaven and Earth. How still it was and formless, standing alone, and undergoing no change, reaching everywhere and in no danger of being exhausted! It may be regarded as the Mother of all things. I do not know its name, and I give it the designation of the Tao (the Way or Course). Making an effort further to give it a name I call it The Great. Great, it passes on in constant flow. Passing on, it becomes remote. Having become remote, it returns. Therefore the Tao is great; Heaven is great; Earth is great; and the sage king is also great. In the universe there are four that are great, and the sage king is one of them. How know I that it is so with all the beauties of existing things? By this nature of the Tao. All things are produced by the Tao, and nourished by its outflowing operation. They receive their forms according to the nature of each, and are completed according to the circumstances of their condition. Therefore all things without exception honor the Tao, and exalt its outflowing operation. This honoring of the Tao and exalting of its operation are not the result of any ordination, but always a spontaneous tribute. Thus it is that the Tao produces all things, nourishes them, brings them to their full growth, nurses them, completes them, matures them, maintains them, and overspreads them. The Way is like an empty vessel which is the ancestry from which come all things in the world. The value of an act is judged by its timing. Thirty spokes unite in the hub, but the worth of the wheel will depend on the void where the axle turns. What gives a clay cup value is the empty space its walls create. Usefulness is to be found in non-existence. If you know righteousness, though you die, you shall not perish. If you trust people not enough, they may trust you not at all. Get rid of your preachers and discard your teachers, and the people will benefit a hundredfold. Root out your schemers and renounce your profiteers, and thieving will disappear. Between "yes" and "no" how small the difference; between "good" and "evil" how great the difference. He who is not a competitor, no one in the whole world can compete with him. If you work by the Way, you will be of the Way. Little faith is put in those who have little faith. There is something that existed before the earth and the sky began and its name is the Way. Man conforms to the earth; the earth conforms to the sky; the sky conforms to the Way; the Way conforms to its own nature. As for those who would take the whole world to tinker with as they see fit, observe that they never succeed. The wise reject all extremes. Those who are on the Way might be compared to rivulets flowing into the sea. He who understands others is wise; he who understands himself is enlightened. He who conquers others is strong; he who conquers his own will is mighty. Absence of desires brings tranquility. A cart is more than the sum of its parts. The Way is nameless and hidden, yet all things gain their fulfillment in it. To the good I would be good, and to the bad I would be good; in that way all might become good. Wars are best waged by stratagem; but people are best governed by forthrightness. The more prohibitions, the more poverty; the more laws, the more crimes; the more skills, the more luxuries; the more weapons, the more chaos. In serving Heaven and in ruling men use moderation. Everything difficult must be dealt with while it is still easy. A Thousand-mile journey can be made one step at a time. Three things prize above all: gentleness, frugality and humility. For the gentle can be bold, the frugal can be liberal and the humble can become leaders of men. If you cannot advance an inch, retreat a foot. Taoism has historically taken two different roads. Taoism as a philosophy, or philosophical Taoism, began around 300 B.C. Emphasizing the Tao as the source of ultimate reality, philosophical Taoism attempted to put man in touch with the harmony of nature by allowing him to exercise freely his instincts and imaginations. By this time Buddhism had made its appearance as a great and significant factor in Chinese religious life. Neither Confucianism, the rather stiff and formal mode of Thought and behavior known chiefly to the literati and officials, nor Taoism, still the preoccupation either of intellectuals on the one hand or of students of the esoteric and the occult on the other, was wholly satisfactory to the unlearned and lowly masses. Hinayana Buddhism was no better in the eyes of these unlettered but spiritually hungry souls, but the Mahayana was another matter. The beneficent Bodhisattvas who gave aid in daily life and the Dhyani Buddhas who admitted one to paradise, were soon being plied with gifts and prayers by millions. As Buddhism swept across China and into Korea, the Taoists, struck with amazement and yet sure that China had her own resources, so to speak, in the way of gods and spirits, began to look into their own heritage, and finding much to value, they began to ape the powerful faith brought in from India (John B. Noss, Man's Religions, New York: MacMillan Company, 1969, p. 272). Religious Taoism had sacred scripture, a priesthood, temples and disciples. There was also an eschatological belief that a new age would come about, overthrowing the old established order. As time went on, gods were brought into the religious system along with belief in heaven and hell and eventually the deification of Lao-tzu. Taoism has for many years been in decline. According to the latest reports, as a religion it is now dead. The government frowns upon it and is determined to suppress it. But many still cling to it as magic, no matter how secret they must be about it nor how carefully they must try to elude the vigilant eye of the Communist district leaders (Ibid., p. 274). Its not sufficiently personal and responsible Supreme Being. Its founder's positively ignoble example of withdrawing from difficulty; not organizing for reform. Its inadequate recognition of the evils in the world. Its inadequate appreciation of physical facts and resources, discouraging to scientific inquiry. Its over-emphasis on inactivity (Wu-Wei), belittling to human effort. Its lack of a commanding enthusiastic principle for living; mostly negative advice. Its ethical ideal of indifference and irresponsibility. Its inadequate conception of immortal life; merely a protracted existence. Its lack of a program for the uplift of society; only a return to an uncivilized simplicity. Its relapse into polytheism, demonolatry, and practice of magic (Hume, op. cit., p. 151). Although Taoism may have run its course in China, it is a very real threat in the West. With the hippie generation the United States saw the advent of the "tune out, drop out" mentality, a mentality completely suited to Taoist philosophy. We can rest assured, however, that even though the Tao may have a temporary appeal, it ultimately cannot fulfill its disciples. The impersonal Tao is in stark contrast to the personal loving God of Christianity, who is both willing and able to meet the deepest needs we all have. The Bible says, "Come to Me, all who are weary and heavy laden, and I will give you rest. Take My yoke upon you, and learn from Me, for I am gentle and humble in heart; and you shall find rest for your souls. For My yoke is easy, and My load is light" (Matthew 11:28-30 NASB). Taoism has no real answer to the problem of evil, for the Taoist "solution" of ignoring or withdrawing from the ills of society does nothing to cure Those very real ills. Jesus, on the other hand, taught His disciples to get involved with the problems of the world. "Go therefore and make disciples of all the nations, baptizing them in the name of the Father and the Son and the Holy Spirit" (Matthew 28:19 NASB). "But you shall receive power when the Holy Spirit has come upon you; and you shall be My witnesses both in Jerusalem, and in all Judea and Sumaria, and even to the remotest part of the earth!' (Acts 1:8 NASB). God, through Jesus Christ, got involved with the problems we all face and provided a once-and-for-all solution by His death on the cross. The near extinction of the religious side of Taoism is a testimony to the fact that it doesn't meet our deepest needs. God in Jesus Christ made the ultimate identification with our suffering and by it, secured our salvation from it. "Since then the children share in flesh and blood, He Himself likewise also partook of the same, that through death He might render powerless him who had the power of death, that is, the devil; and might deliver Those who through fear of death were subject to slavery all their lives... Therefore, He had to be made like His brethren in all things, that He might become a merciful and faithful high priest in things pertaining to God, to make propitiation for the sins of the people. For since He Himself was tempted in that which He has suffered, He is able to come to the aid of Those who are tempted" (Hebrews 2:14, 15, 17, 18 NASB). Chuang tzu -A later disciple of Lao-tzu who wrote some 33 books which helped popularize Taoism. Lao-tzu-Chinese sage and philosopher who founded Taoism. Tao Te King -Literally translated, "The Way and Its Power." This small book, supposedly written by Lao-tzu, is the sacred scripture of Taoism. The work advocates enduring the hardships of the world through noninvolvement, thereby giving the individual a better chance for survival. Sometimes called Lao-tzu, after its supposed auTaor. The Tao -Literally, the "Way" or "Path." The Tao is the inexpressible way of ultimate reality by which one should order his life. Wu Wei -The concept of inaction, taught in the Tao Te King. By practicing Wu Wei, one can get his life in harmony with the Tao and live as he is meant to live. Yin-Yang-The Yin and Yang represent elements in the universe that are contrary to each other, such as life and death, light and darkness, good and evil. The Yang represents positive elements, the Yin the negative elements. Bush, Richard C., The Story of Religion in China, Niles, IL: Argus Communications, 1977. Chan, Wing-Tsit, ed., A Sourcebook in Chinese Philosophy, Princeton, NJ: Princeton University Press, 1963. Mueller, Max, ed., Sacred Books of the East, London: Krishna Press, 1879-1910. Noss, John B., Man's Religions, New York: MacMillan Company, 1969. 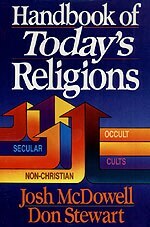 Rawlings, Maurice, Life-Wish: Reincarnation: Reality or Hoax, Nashville: Taomas Nelson Inc., 1981.